Apart from his power projects like The Thing, Mats Gustafsson has always been interested in working with pianists. At last year’s Konfrontationen festival in Nickelsdorf (where Gustafsson lives by now) he played with one of his all-time heroes: French free jazz icon François Tusques. The audience was enthusiastic, but in the end, the collaboration had some weaker moments, especially when Gustafsson switched to the bass saxophone. His own approach did not always match with Tusques’ way of music-making. However, his style perfectly complements the playing of Majorcan pianist Agustí Fernandéz, with whom he has already collaborated on a few occasions: They’ve played together in Barry Guy’s New Orchestra as well as in an energetic trio alongside Peter Evans, and they’ve recorded the superb duo “Critical Mass” (PSI, 2005) and the great trio album “Breakin’ the Lab!” (with drummer Ramón Prats). The title of their new album “Constellations” is programmatic since the record comprises ten tracks, seven of which present both musicians as masters of extended techniques. Improvisations like Altinak or Ursa make you feel as if you were trapped in a huge pinball machine; the music is an emotional up and down, seesawing permanently between sounds produced by playing “inside” the piano and unconventional saxophone noises. Fernandéz uses various different materials to manipulate the strings of his instrument, creating eerie gurgling, rattling and scratching sounds which clash into Gustafsson’s high energy outbursts on the saxophone. At times, though, these tracks show yet another facet of the duo’s interplay: they sometimes become cut-up sound explorations, nervous and erratic, with Gustafsson’s playing reduced to little more than clicks, clacks and plain breathing – classic examples of this very “constellation.” Gustafsson and Fernandéz are playing mind games with the listener, constantly subverting expectations. Another constellation is presented in the remaining three tracks, in which Fernandéz simply concentrates on the 88 keys of the piano – and these pieces are clearly meant as an homage to Cecil Taylor’s music. Fernandéz is obviously influenced by that pioneer’s style and technique, which becomes evident in the disconnected fast runs, arpeggios and the hard touch. Gustafsson is at his best when he can dance around these dense harmonic structures (he sounds like Evan Parker on Mintaka, for example). Listening to these tracks is like watching two bumblebees in full speed chasing each other. 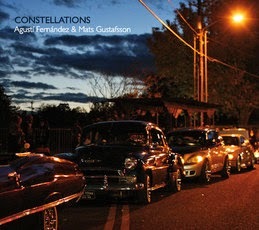 “Constellations” is an excellent album; fans of both musicians (like me) can’t go wrong. You can buy it from www.instantjazz.com.